A woman was pulled from a collapsed building on Indonesia's tourist island of Lombok on Tuesday, a rare bright spot two days after an earthquake that has killed over 100, destroyed villages and left thousands homeless. The death toll from a powerful earthquake that hit Indonesia's tourist island of Lombok topped 100 on Tuesday as rescuers found victims under wrecked buildings, while thousands left homeless in the worst-affected areas waited for aid to arrive. A woman, however, was pulled from the rubble of a collapsed grocery store in the north, near the epicentre of Sunday's 6.9 magnitude quake, the second tremor to rock the tropical island in a week. That was a rare piece of good news as hopes of finding more survivors faded and a humanitarian crisis loomed for thousands left homeless by the disaster in the rural area, and in desperate need of clean water, food, medicine and shelter. Sutopo Purwo Nugroho, spokesperson for Indonesia's disaster mitigation agency (BNPB), put the toll at 105, including two on the neighbouring island of Bali to the west, where the quake was also felt. The figure was expected to rise. See some of the images from the aftermath of the quake. Nadia Revanale, 23, was shopping in a minimart in Pemenang at the time of the tremor, the second major quake to rock the island in a week. Neighbours heard cries for help from the mangled concrete and alerted rescuers, who took four hours to extract her. "First we used our hands to clear the debris, then hammers, chisels and machines to slowly remove the pieces," Marcos Eric, a volunteer rescue worker from a mining company, told Reuters after an ambulance had taken the woman away. "It took many hours but we're thankful it worked and this person was found alive." 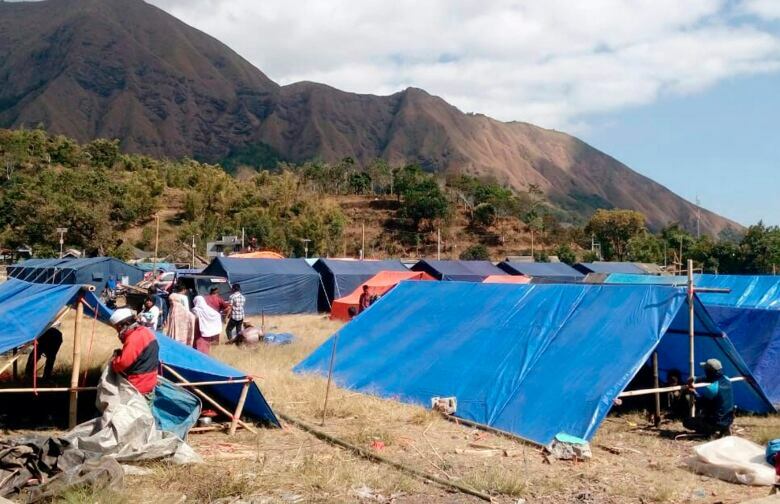 Lombok had already been hit by a 6.4 earthquake on July 29 that killed 17 people and briefly stranded several hundred trekkers on the slopes of a volcano. The BNPB said more than 20,000 people had been displaced by the quake as it brought down or damaged some 13,000 houses, and many of those were living in open areas in need of food, medicine and other aid. Few buildings were left standing in Kayangan on the island's northern end, where residents told Reuters that as many as 40 died. Some villagers used sledgehammers and ropes to start clearing the rubble of broken homes, but others, traumatized by continued aftershocks, were too afraid to venture far from tents and tarpaulins set up in open spaces. There has been little government relief for the area, where the greatest need is for water and food, as underground water sources have been blocked by the quake and shops destroyed or abandoned. About 75 per cent of the north has been without electricity since Sunday, officials said, and some communities were hard to reach because bridges were damaged and trees, rocks and sand lay across roads cracked wide open in places by the tremor. "Thousands of people moved to scattered locations," Sutopo told a news conference in Jakarta. "People have moved to the hillsides where they feel safer. It's difficult for help to reach them. We advise people to come down and move closer to the camps." Aid agency Oxfam said it was providing clean drinking water and tarpaulin shelters to 5,000 survivors, but the need was much greater, with more than 20,000 estimated to have been displaced. "Thousands ... are under open skies in need of drinking water, food, medical supplies, and clothes," it said in a statement. "Clean drinking water is scarce due to the extremely dry weather." Not far from the grocery store scene, rescuers heard a weak voice coming from under a two-storey mosque, where four people were believed to have been trapped when the building flattened. "We are looking for access. We have a machine that can drill or cut through concrete, so we may use that. We are waiting for heavier equipment," Teddy Aditya, an official of the Indonesian Search and Rescue Agency (Basarnas), told Reuters. 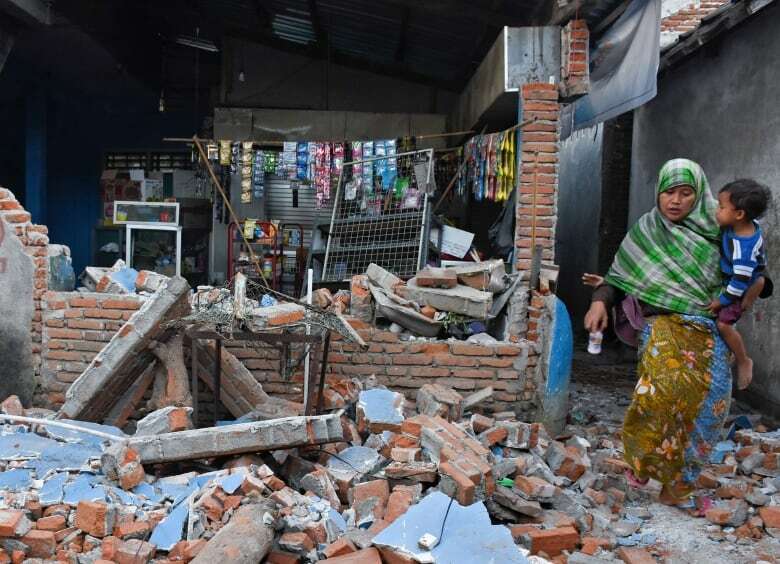 Quakes continued to rattle the island, including a 5.5 magnitude tremor at around 2 a.m. local time, Indonesia's meteorology and geophysics agency said (BMKG). More than 230 aftershocks were recorded by Tuesday morning, BMKG data showed. 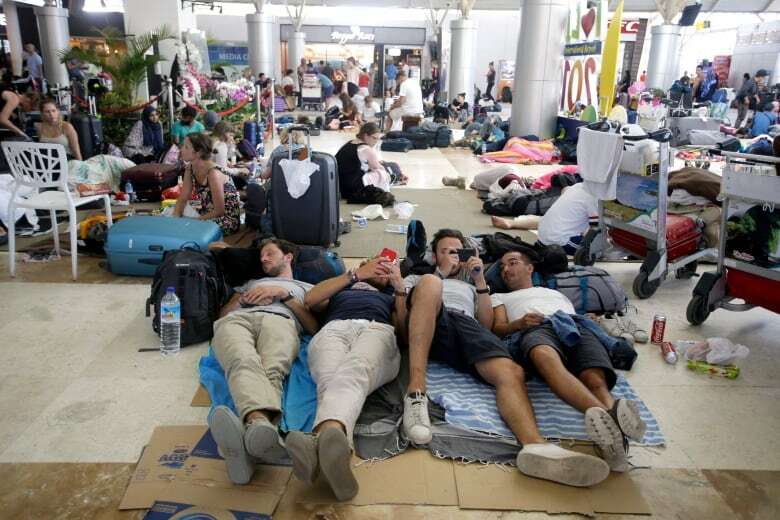 Thousands of tourists have left Lombok since Sunday evening, fearing further earthquakes, some on extra flights that were laid on by airlines and some on ferries to Bali. 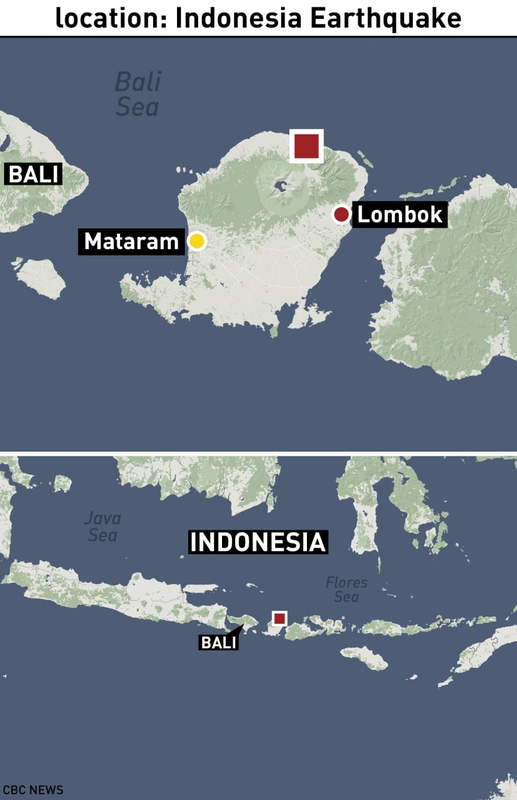 Officials said about 4,600 foreign and domestic tourists had been evacuated from the three Gili islands off the northwest coast of Lombok, where two people died and fears of a tsunami spread soon after the quake. Saffron Amis, a British student on Gili Trawangan — the largest of the islands that are fringed by white beaches and surrounded by turquoise sea — said there were at least 200 people stranded there and others were still arriving from the other two, Gili Air and Gili Meno. "We still have no wifi and very little power. Gili Air has run out of food and water so they have come to us," she told Reuters in a text, then messaging later that she had been taken on a boat to the main island and would head from there to Bali.